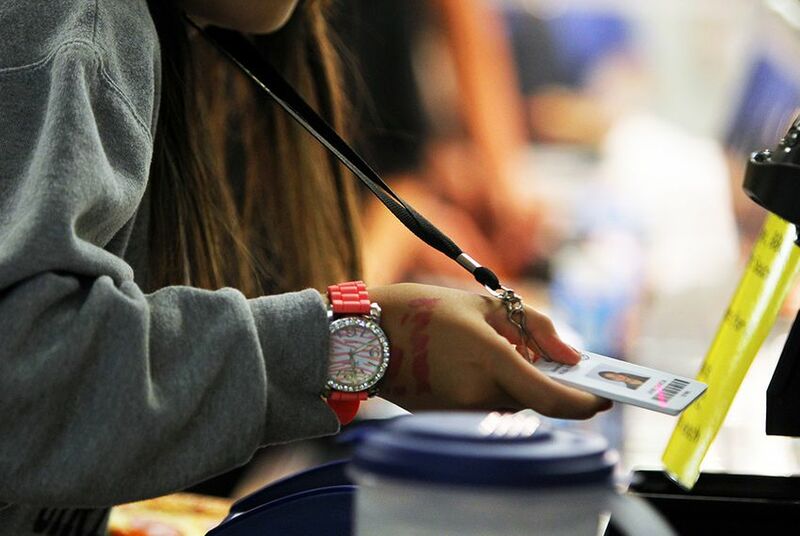 A San Antonio district has implemented a pilot program to track students while on campus, having them wear radio frequency identification chips on cards around their neck. Administrators say it's the best way to make sure they get all the state money they're entitled to. SAN ANTONIO — For Tira Starr, an eighth grader at Anson Jones Middle School, the plastic nametag hanging around her neck that she has decorated with a smiley face and a purple bat sticker offers a way to reflect her personal flair. For administrators, it is something else entirely: a device that lets them use radio frequency technology — with scanners tucked behind walls and ceilings — to track her whereabouts. 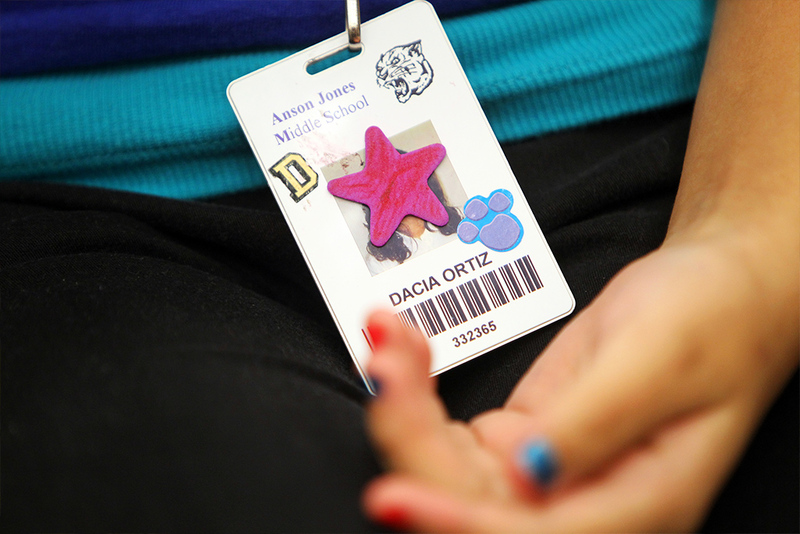 Anson Jones is the first school in San Antonio’s Northside Independent School District to roll out the new nametags, which are part of a pilot program intended to ensure that the district receives all of the state dollars to which it is entitled. In Texas, school finance is a numbers game: schools receive money based on the number of students counted in their homeroom classes each morning. At Anson Jones, as at other schools, many students were in school but not in homeroom, so they were not counted and the district lost money, said Pascual Gonzalez, a spokesman for the district. “We were leaving money on the table,” he said, adding that the district expects a $2 million return on an initial investment of $261,000 in the technology at two pilot schools. But the radio frequency identification nametags have prompted concerns from civil liberties groups and electronic privacy watchdogs, which fear a Big Brother atmosphere in Texas public schools. Matthew Simpson, a policy strategist for the American Civil Liberties Union of Texas, said the technology was easy to acquire, meaning people outside a school might be able to monitor a student if they obtained the student’s unique tracking number. Simpson said the technology was originally designed for shipping goods and for cattle. “It was never intended for people,” he said. But students and educators at Anson Jones say they are excited about the practical advantages — getting to eat lunch faster by scanning their bar codes in the lunch line, or being able to locate a child quickly in an emergency. Students decorate their nametags with stickers. ago. The Spring district, for example, started using the technology in 2004 as a way to track elementary students getting on and off buses. It expanded the program to high school students three years ago and has so far recovered $400,000, said Karen Garrison, a spokeswoman for the district. “Our system still focuses on safety but has the added benefit of recovering average daily attendance funding,” Garrison said. Wendy Reyes, the principal of Anson Jones, said only one parent had complained about the program at her school. On the first day of classes at Jay High School, home to the other pilot program school in Northside, several parents staged a small protest across the street from the school’s entrance, though most did not have students in the district. Many students, teachers and parents at the middle school feel the technology’s benefits outweigh privacy concerns, Reyes said.